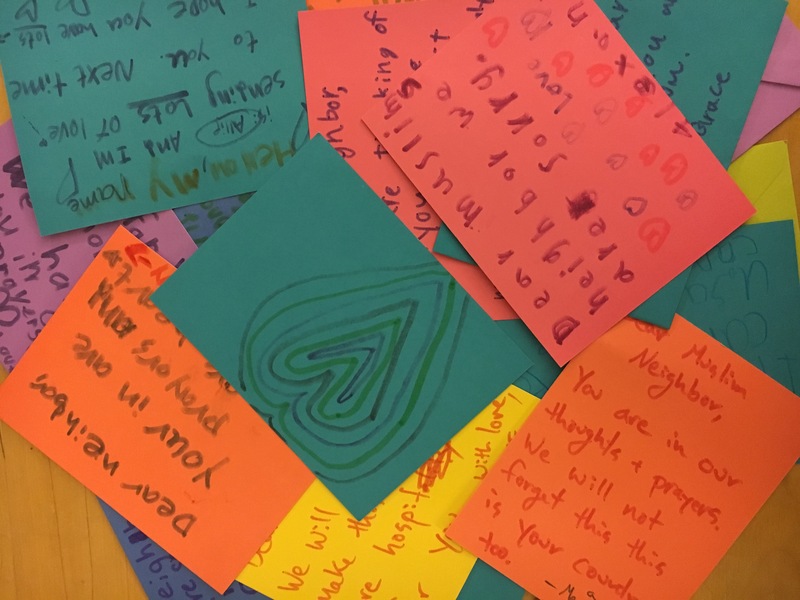 Love notes from Mennonite children to their Muslim neighbors. Photo by the author. We marched. Two hundred of us. People of all races and ages. Love for our Muslim neighbors coursed through us, our lives streaming into the streets, all of us winding our way to the capitol building in downtown Raleigh, North Carolina. There, on the government steps, under the watchful gaze of the state’s monument to the Confederacy—a bronze soldier erected in 1895, resting on a marble pedestal with the inscription, “To Our Confederate Dead”—I saw seventy white supremacists. They were mostly men, a loud and angry assembly of white people wearing military camouflage, bulletproof vests, and helmets, dressed as if preparing for a domestic war to defend their racist and religious ideology. One of them held a megaphone in one hand and a huge, red Bible in the other. He preached lies about Islam and shouted racist slander. And we had music: drums, whistles, kazoos, and our voices. I stood beside a group of Arab women in their twenties with black and white keffiyehs covering their heads, the scarves flowing down around their shoulders. They were playing blue and pink recorders, plastic flutes with Disney princesses on them. Maybe the women had stopped at Toys“R”Us on the way to the protest, looking for the perfect instrument to oppose the slurs of militarized white supremacists. Next to us were young girls—three sisters, two of them wearing hijabs. They were dancing to the music so enthusiastically that the women playing recorders noticed and moved toward them in the crowd. Soon the children were playing the plastic flutes themselves, swaying and twisting, jumping and twirling through the crowd. Their fearless joy announced that they belong here, that these streets are their streets, that our cities are their cities, that this country is their country. I chanted in outrage, while they danced with delight. Our Mennonite kids entrusted me with their love notes, adorned with sticky globs of sparkles, which I took to Friday prayers at our local masjid. After the imam introduced me to his congregation, I handed out the cards to the people in the front rows, explaining our children’s concern for them, and passing along their love. Soon the muezzin began chanting the adhan, the call to prayer, his song filling our ears as the faithful joined their voices, calling out to Allah: God the most gracious, the most merciful. The congregation stood and bowed and kneeled in a synchronized movement of reverence, humility before God and one another. In their Friday prayers, I glimpsed the truth of Allah’s beauty, God’s ecstatic love likewise manifest in the downtown streets, in the women and girls wearing keffiyehs and hijabs, playing Disney flutes and dancing a prophecy of a new world—a world abounding with Allah’s grace and mercy, profuse with love and beauty. Isaac S. Villegas is the pastor of Chapel Hill Mennonite Fellowship in North Carolina. A year after the Chapel Hill shooting of three young Muslim-Americans, reporter Reema Khrais reflects on what it was like covering the tragedy.